Any of the restaurants which overlook the river will cost a lot more than the ones on the other side since you are paying for the privilege of that incredible view! Reservations for anything on this side are highly recommended. We had our heart set on Yakitori. 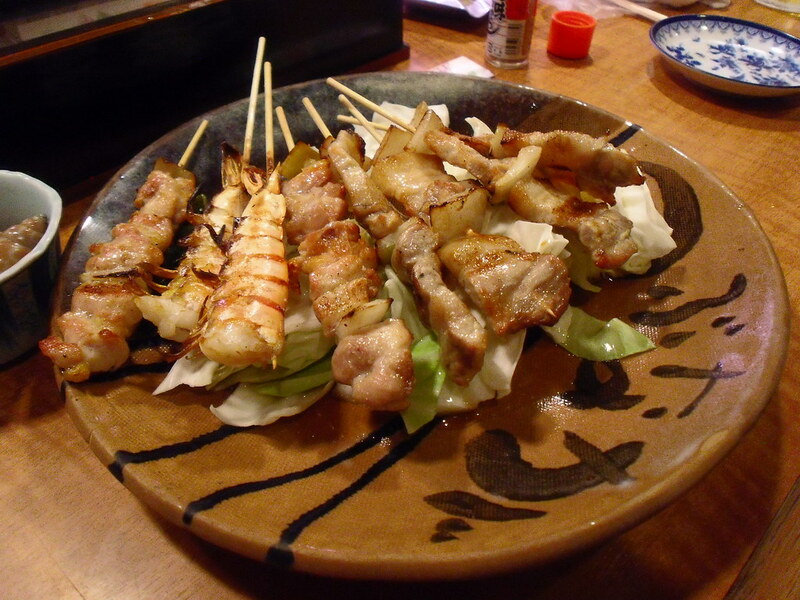 Yakitori is a Japanese dish of skewered meat, veggies and/or tofu, grilled over charcoal. The different dishes are topped with seasoning and served to the customer on a bamboo stick or, in more modern restaurants, a steel skewer. Some of the most popular kinds of yakitori are chicken and spring onions, chicken skins, intestines, cartilage, tongue and tails. 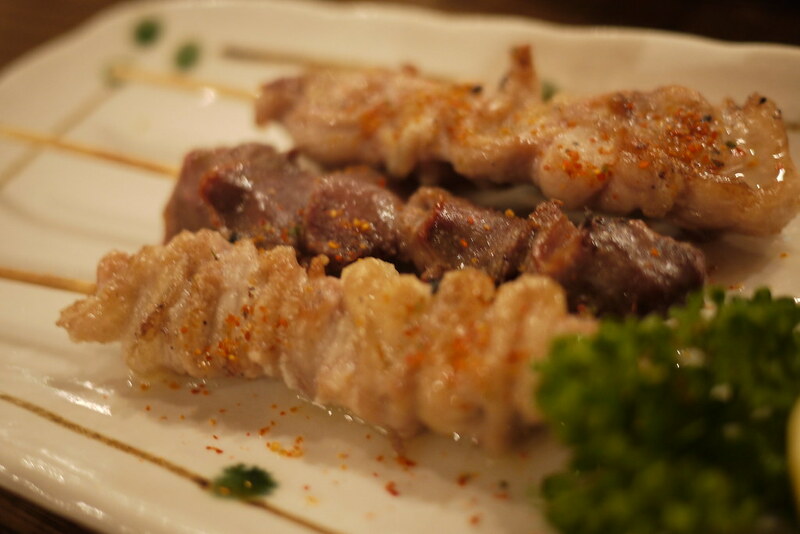 Yakitori is an excellent opportunity to experiment. Each skewer is quite cheap and small enough that you can try lots of different options. You can order more and more throughout the evening; you don't have to choose everything you want all at once. You will find yourself peering at other tables and studying other people's order for your next dish. We settled on a restaurant with a partial English menu, reasonable prices (but not bargain basement) and a small line up of people. In Japan, if there is a line-up of locals, chances are this is a good sign that this is the place to be. We had waited only about 10 minutes before we were seated at the bar, where we could see the chefs cooking and preparing hundreds of different combinations of meat on a stick. They worked in quick succession, keeping the fire hot and the meat constantly rotating and plating. We ordered small selections of meat and veggies to start and even chanced it on a few stranger combinations like heart, skin and intestines. The food was incredible. It was so fresh, so moist and sooo tasty! Even the odder selections were delicious, and we found ourselves ordering more of them than anything else! This is one of the things I love about travelling; it pushes you to try things you'd never even think of ordering at home. My favourite had to be the seafood though. The clam cooked in soy sauce and butter had the most intense umami flavour which complimented the taste of the seafood perfectly. After a few more beers to wash it all down, we headed back out onto the streets to walk off all that heavy meal! We were looking for a sweet treat after all the salt from dinner, so we stopped into the local convenience store to scour the shelves for a little dessert. I settled on some plain dango, and we took it home on the subway to enjoy curled up in bed, watching some Japanese game shows after a very long day exploring Kyoto. 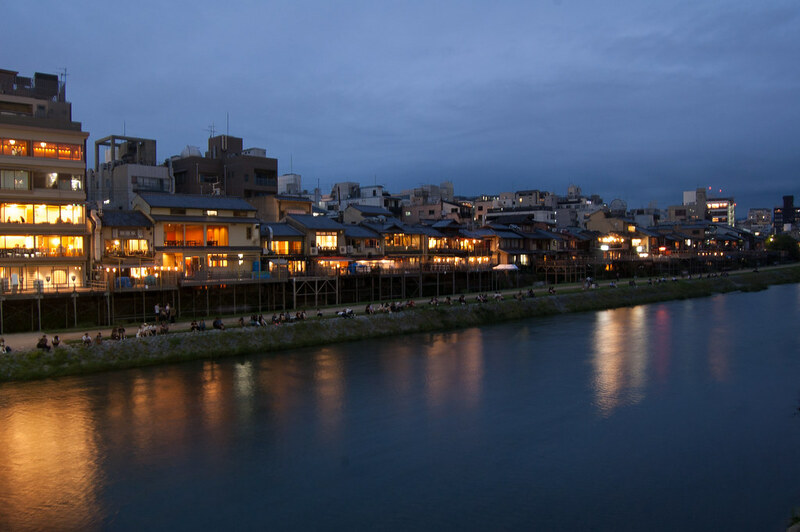 Other people might enjoy staying inside the Izakaya all night or would like to go to a club but for us, a night inside of Ryokan enjoying the comforts of a home away from home was all we needed to complete an already perfect evening.